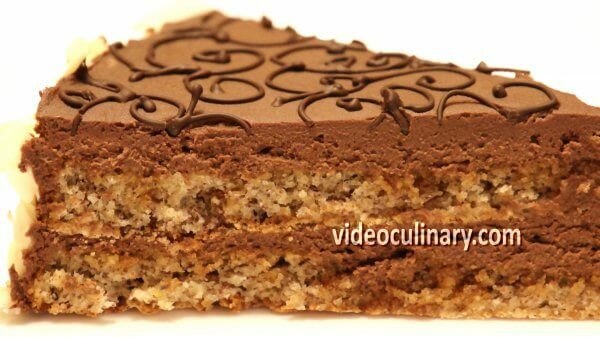 This easy gluten-free cake is made of hazelnut sponge layers filled with chocolate ganache. 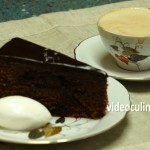 Try our exceptionally easy recipe for a flourless hazelnut- chocolate cake! 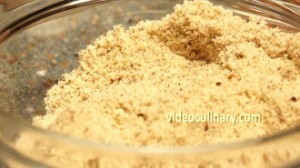 You could buy or make hazelnut flour yourself. 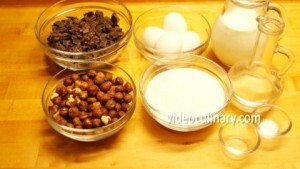 To make it at home, toast and grind 350 grams (12 oz) hazelnuts into fine powder using a coffee grinder. 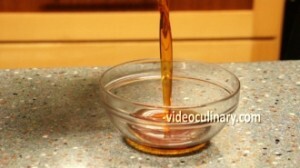 Make the caramel simple syrup: Place 100 grams (3.5 oz) of sugar and ½ teaspoon of lemon juice in a saucepan. Melt the sugar and cook to a deep umber color. 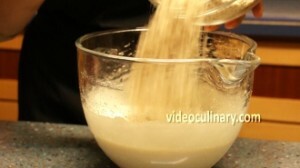 Remove from the heat, and gradually add 100 ml (4 fl oz) of warm water, stirring constantly with a whisk until combined. 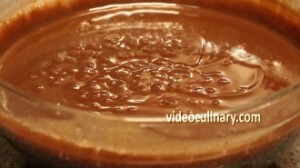 Make the chocolate ganache: Bring 400 ml (14 fl oz) of heavy cream to boil and pour over 380 grams (13 oz) of chopped dark chocolate. Stir until melted and smooth. 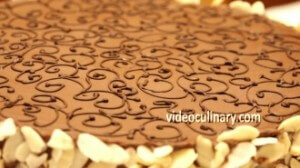 Cover the ganache with plastic wrap. Refrigerate for a few hours until cool. Make the hazelnut sponge: Place 6 eggs, 400 grams (14 oz) of sugar and a pinch of salt in a bowl and set over simmering water. 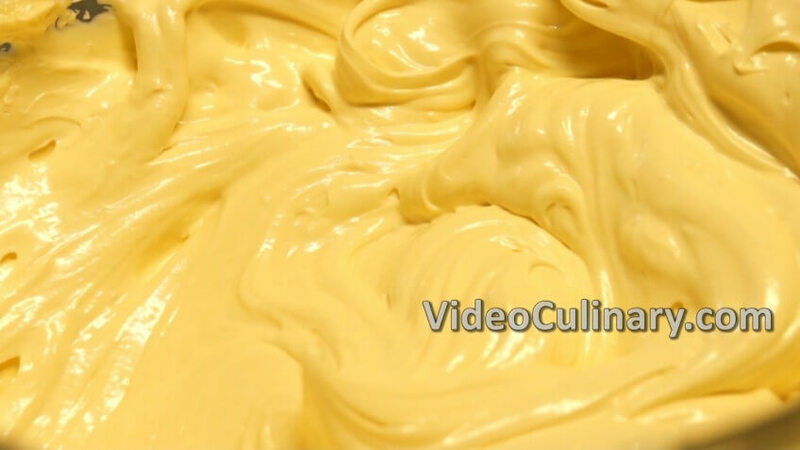 Stir constantly, until the mixture reaches 60°C (140°F). 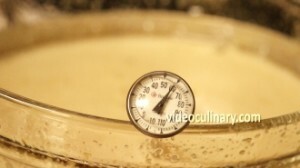 Remove from the heat and whisk on high speed until the mixture cools. 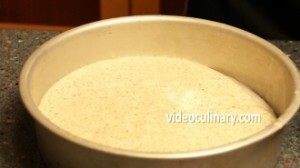 Add 350 grams (12 oz) of hazelnut flour, and fold until smooth. 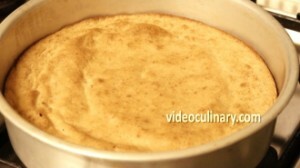 Divide the batter evenly between two 26 cm (10 inch) cake pans, greased and lined with parchment paper. 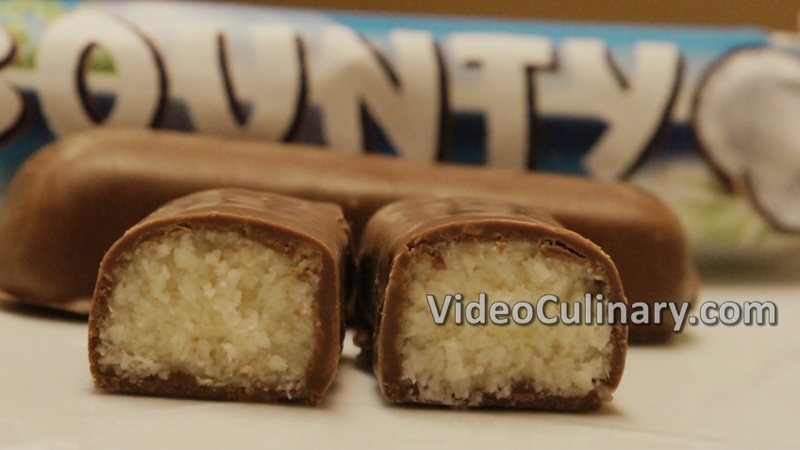 Bake at 180°C (350°C) for about 30 minutes. 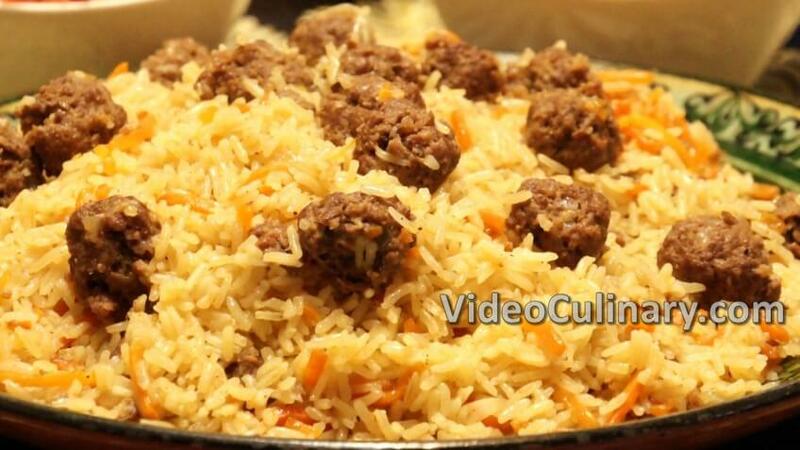 Test for doneness- an inserted skewer should come out clean. Unmold and cool. If you do not have two cake pans of the same size, pour the batter into one cake pan, bake for about 40-50 minutes and slice the cake into 2-3 layers after baking and cooling. 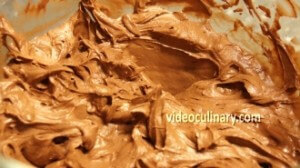 Whip the chocolate ganache on high speed until stiff. The ganache whips very quickly. Assemble the cake: Place a cake layer on a serving plate. Moisten the hazelnut sponge with half of the caramel simple syrup, and spread half of the chocolate ganache over the cake layer. Place the second layer on top, flat side up. 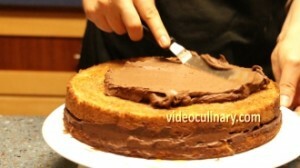 Moisten with the remaining caramel simple syrup and spread the ganache evenly over the top and sides of the cake. 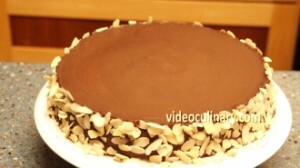 To decorate the cake, garnish the sides with slivered almonds, and pipe a chocolate pattern using a parchment paper cone. 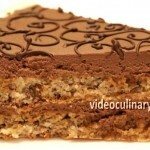 Serve this delicious Chocolate-Hazelnut cake with tea or coffee. 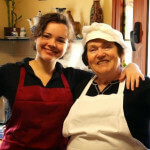 Visit our website for a Devil’s food cake, Easy chocolate coconut cake, and for more great recipes.